The research focus of the Environmental Toxicology Laboratory run by Hongbo Ma is to understand the potential human and environmental health effects of both conventional contaminants (e.g., heavy metals) and chemicals of emerging concern (e.g., engineered nanomaterials) using alternative animal models such as the nematode Caenorhabditis elegans and zebrafish embryo. Current research project is centered on human health impact of engineered titanium dioxide (TiO2) nanoparticles. Engineered nanomaterials (with at least one dimension < 100 nm, 1 nm = 10-9 m) are used in a broad spectrum of applications due to their unique physical and chemical properties arisen from their extremely small size. A lot of such materials have been incorporated into human consumer products such as cosmetics and food additives. Yet their potential health effects to human and the environment have been largely unknown. 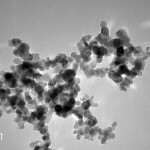 One such example is TiO2 nanoparticles. Although bulk-sized TiO2 has been traditionally considered as safe to human, more recent studies on mammalian models suggest that long-term exposure to low level of TiO2 nanoparticles induces systemic genetic damage and increases the risk of cancer. 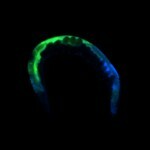 The nematode C. elegans provides an excellent model for toxicological studies due to its high conservation from human biology, genetic manipulability, and ease of maintenance. Our laboratory is exploring the C. elegans as a model to understand the potential uptake, accumulation, and biological consequences from exposure to TiO2 nanoparticles, by integrating genetic/molecular tools (e.g., microarray, transgene expression) and advanced analytical techniques (e.g., SEM (Scanning Electron Microscope) and Single Particle ICP-MS (Inductively Coupled Plasma Mass Spectrometry). Findings from these studies will help to fill the knowledge gap for human health risk assessment and management for engineered nanomaterials. We are also interested in developing methodologies for exposure assessment of nanoparticles in humans and the environment, and identifying potential hazards that require further investigation.